Will Fiscal Austerity Work Now? An update on some developments on the fiscal-trap front: After a Levy brief on fiscal traps was issued in November, events continue to bear out the fears expressed therein that budget cuts and tax increases being implemented in Europe and the US would lead to disaster. For example, recent news coverage of events surrounding the announcement of the UK budget confirm that the trap can hit nations that possess their own currencies, particularly in a region such as Europe where recessionary forces are dominating at the moment. Martin Wolf notes that owing to disappointing growth figures, the UK deficit surprised again on the high side. As the fiscal-trap theory asserts, governments implementing austerity policies have run into unexpectedly low growth in their attempts to reduce government debt. Dollar amounts shown in billions. The authors lay out a scenario (“scenario 3” in the analysis) featuring some favorable macroeconomic tailwinds in the form of higher private sector borrowing and increased exports. As they explain, such developments are not entirely unlikely (and policy changes could help contribute to such an export boost). Nevertheless, even in these relatively rosy circumstances the government would need to pitch in a spending increase of 6.8 percent* (after inflation) in each of 2013 and 2014 to bring the unemployment rate below 6 percent by the end of 2014. That would amount to a stimulus program worth around $600 billion over the next two years. Without these tailwinds from private sector borrowing and exports (“scenario 2”), spending would need to increase by 11 percent per year — or roughly over a trillion dollars of stimulus over two years — in order to bring unemployment down to around 5.5 percent. As the authors note, Washington is not in the mood for a trillion-plus-dollar stimulus program, or a program half that size. Congress has consistently rejected a mere $50 billion for infrastructure repair. 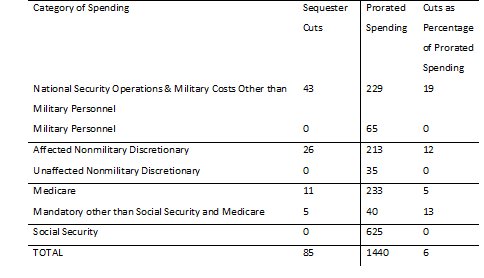 If anything, the policy challenge of the moment is to temper the zeal for cutting spending. Moreover, 5.5 percent unemployment is arguably still shy of what we ought to consider “good enough.” This level is around a full percentage point above where we were before the recession hit in 2007. In other words, even if this Congress were to approve a stimulus package larger than the 2009 Recovery Act (ARRA) — which is unimaginable at this point — we would still not be back to pre-recession unemployment levels after two years (or even four years, as the strategic analysis demonstrates). Assuming no further stimulus is possible, the “best case” scenario over the next four years might be to merely hold off any new attempts at grand bargains or further budget cuts; to maintain the miserable status quo on the budget. 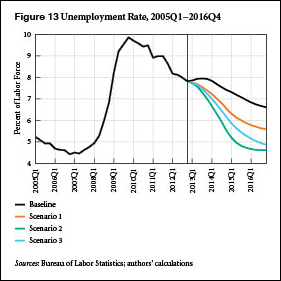 In that case, as the figure below illustrates (the authors’ “Baseline” forecast represented by the black line), unemployment would still be above 7 percent in two years, and above 6.5 percent by the end of President Obama’s term in office (which, as the authors point out, is still in excess of the threshold at which the Fed would consider tightening monetary policy). Earlier this month the Athens Development and Governance Institute and the Levy Economics Institute held a forum on the eurozone crisis: “Exiting the Crisis: The Challenge of an Alternative Policy Roadmap.” Below are the remarks delivered by senior scholars Jan Kregel and James Galbraith. In a new, wide-ranging policy note, C. J. Polychroniou traces the roots and evolution of the present “era of global neoliberalism”; an era he portrays as mired in perpetual crisis and dysfunction, and ripe for change. [N]eoliberalism itself is more of an ideological construct than a solidly grounded theoretical approach or an empirically-derived methodology. In fact, the intellectual foundations of neoliberal discourse are couched in profusely vague claims and ahistorical terms. Notions such as “free markets,” “economic efficiency,” and “perfect competition” are so devoid of any empirical reference that they belong to a discourse on metaphysics, not economics. Polychroniou attempts to outline the central principles of a progressive, post-Keynesian economic policy alternative. His primary target: changing the relationship between the state and the financial sector. Yesterday, Dimitri Papadimitriou joined Ian Masters to discuss the response to the banking crisis in Cyprus. The plan on the table, in which Cypriot banks would impose a deposit tax (9.9 percent on deposits above €100,000, and 6.75 on deposits below that) in order to gain access to a €10 billion bailout from the troika, unconscionably makes small depositors pay for someone else’s regulatory blunders — and is likely to be ineffective anyway, said Papadimitriou. Victoria Chick, a student of Hyman Minsky’s, elaborates on an issue that often strikes non-economists as somewhere between scandalous and baffling: the absence of any substantive acknowledgment of money in much of contemporary economics and economic modelling. For more on this question of how to understand money and its role in our economic systems, see this working paper. The antigrowth “fiscal and structural adjustment” program was perfectly designed and would have produced all the anticipated results if the government were better fit to carry out the policies … and if the citizenry did not on occasion make some fuss about them by staging demonstrations here and there or by occupying the square outside the Greek parliament building. In essence, this is what the above statement says. The neoliberal economics applied to Greece by Germany, the EU, and the IMF did not simply cause a greater decline in Greek GDP than “originally projected” or make the debt grow substantially bigger in the course of the last two years (from 126.8 percent in 2010 to 180 percent in 2012). It also produced an economic and social catastrophe of proportions unparalleled in peacetime Europe. Read Polychroniou’s policy note here.